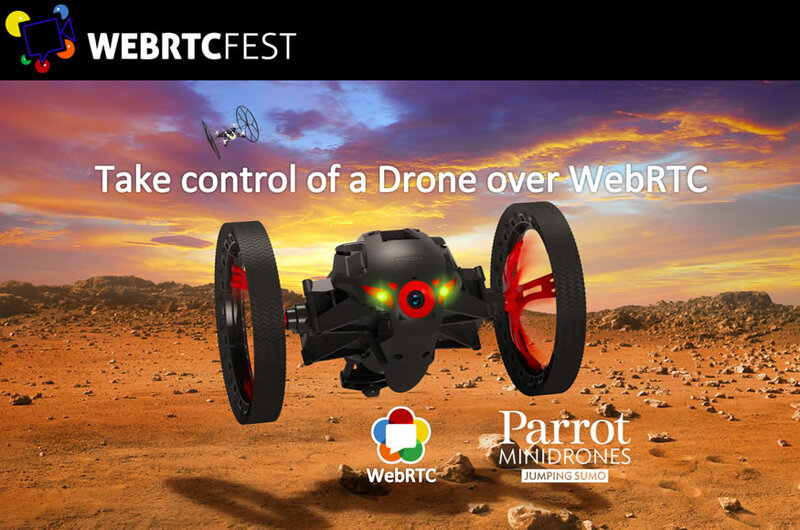 Developers had only a few weeks to submit a hack where they remotely control a Parrot Jumping Sumo Mini-Drone over WebRTC, showing the FPV live stream, and win a Parrot BeBop + SkyController. When the judges tested their hack a few days before, both were equal, but finally, the first team who succeed in making everything work during the event was Neil & Tom, winning the Parrot Challenge. If you want to know the details behind the scenes, Tom wrote a post on this blog about the architecture of their hack. 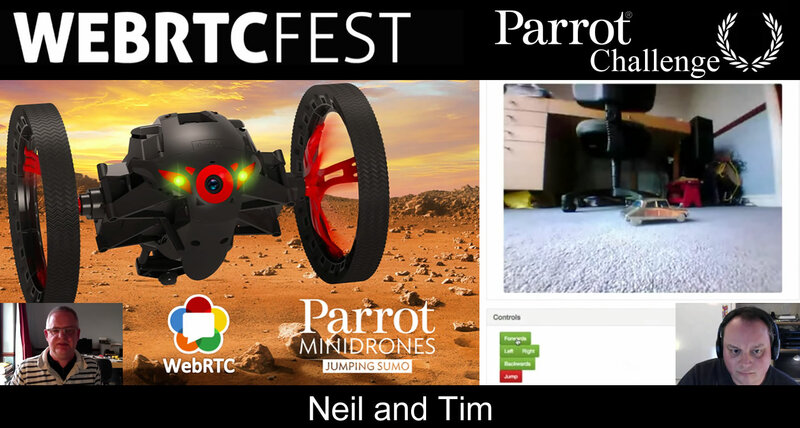 Before the 30th January 2015, at Midnight CET, the team who is first to submit a hack where they remote-control a Parrot Jumping Sumo Mini-Drone over WebRTC, showing the FPV live stream, wins a Parrot BeBop + SkyController. The competition was incredibly fierce from the beginning of the WebRTCfest. 150 registrations to participate to competition, 15 amazing hacks presented as video pitches. The startups were competing for $6,000 and Parrot Drones. After minutes of deliberations, WebRTCfest organizers pored over the judges’ notes and narrowed the list down to five finalists: “Cult answer machine”, “I see you!”, “Smart Assistance”, Togetheroo, And “Video Party”. These projects made their way to the finale to demo in front of our final panel of judges, which were Chad Hart (WebRTCHacks), Dan Burnett (StandardsPlay / W3C Author), Amir Zmora (The New Dialtone), Chris Koehncke (ChrisKranky.com) and Alan Quayle (AlanQuayle.com). 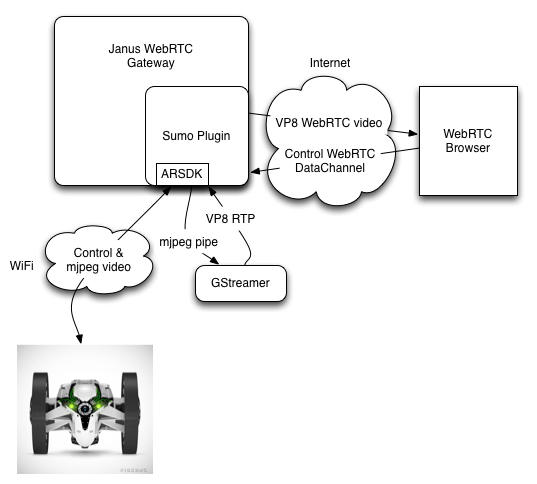 And now, meet the WebRTCfest 2014 winner. While their developers are all talented and hardworking, only 5 of those projects will show their hack on stage on the final round tomorrow. 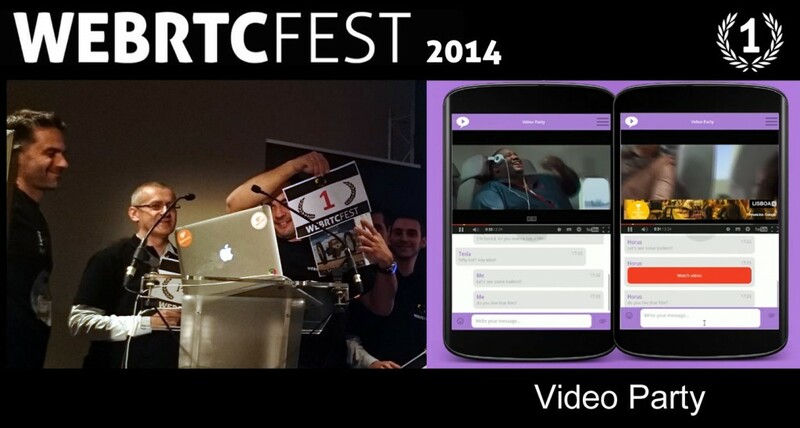 Our 2014 WebRTCfest Finalists are “Cult answer machine”, “I see you!”, “Smart Assistance”, Togetheroo, And “Video Party”, in alphabetical order. Tomorrow, those five teams will present in front of our esteemed Finals Judges: Chad Hart (WebRTCHacks), Tsahi Levi (bloggeek.me), Dan Burnett (StandardsPlay / W3C Author), Amir Zmora (The New Dialtone), Chris Koehncke (ChrisKranky.com) and Alan Quayle (AlanQuayle.com). And in the end, there will be only four. But only one will take home the Parrot Jumping Sumo and $4,000 in cash. Check them out for yourself.